Nowadays, most animal species can be identified genetically by sequencing a fragment of the mitochondrial barcoding gene COI. However, for some species, this method is not applicable due to a more complex genetic make-up, often due to hybridisation. One of these exceptions are the green frogs (pool frog – Pelophylax lessonae, edible frog – P. kl. esculentus and marsh frog – P. ridibundus). This group of frogs has an especially complex genetic composition due to hemiclonal hybridisation and polyploidisation. 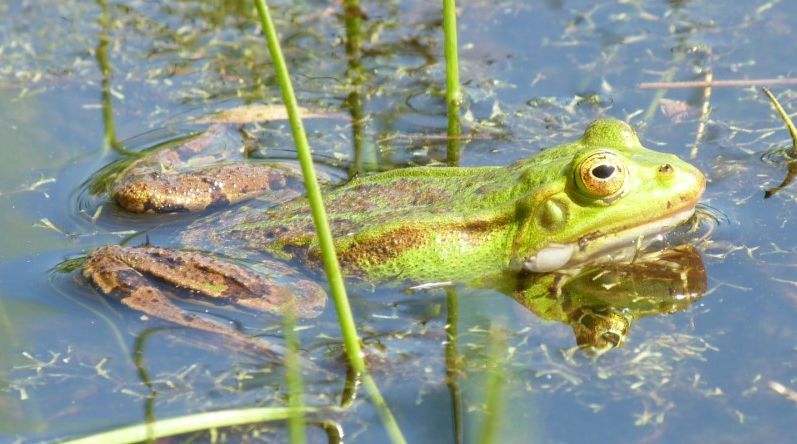 To establish a genetic monitoring tool-kit for green frogs in Luxembourg, we will first apply ddRAD sequencing to a wide range of populations from the whole country. This high-throughput sequencing based method will be used to generate hundreds of genome-wide genetic markers. The resulting dataset will allow to identify individuals on species level and to assess their ploidy. Furthermore, it will enable an estimation of the genetic diversity of the two common species in Luxembourg, the pool frog and the edible frog. In a second step of the project, these genetic data will be used to establish genetic markers for standard genetic monitoring in Luxembourg and to develop recommendation guidelines for their application. Pelophylax sp. (water frog) – Peppange – 09.05.2018 © Hannah Weigand. Project granted by the Ministry of Sustainable Development and Infrastructure, Luxembourg. Duration: one year (15.04.2018 – 14.04.2019). WEIGAND H. & Leese F. (2018) Detecting signatures of positive selection in non-model species using genomic data. Zoological Journal of the Linnean Society. WEIGAND H., Weiss M., Cai H., Li Y., Yu L., Zhang C., Leese F. (2018) Fishing in troubled waters: Revealing genomic signatures of local adaptation in response to freshwater pollutants in two macroinvertebrates. Science of the total environment 633:875-891. Steinbach P., Heddergott M., WEIGAND H., Weigand A.M., Wilwert E., Stubbe M., Helm B., Campbell R.E., Stubbe A., Frantz A.C. (2018) Rare migrants suffice to maintain high genetic diversity in an introduced island population of roe deer (Capreolus capreolus): evidence from molecular data and simulations. Mammalian Biology 88:64-71. WEIGAND H., Weiss M., Cai H., Li Y., Yu L., Zhang C., Leese, F (2017) Deciphering the origin of mito-nuclear discordance in two sibling caddisfly species. Molecular Ecology 26:5705-5715. Vendrami D.L.J., Telesca L., WEIGAND H., Weiss M., Fawcett K., Lehman K., Clark M.S., Leese F., McMinn C., Moore H., Hoffman J.I. (2017) RAD sequencing resolves fine-scale population structure in a benthic invertebrate: implications for understanding phenotypic plasticity. Royal Society open science 4:160548. SCHWEYEN H., Rozenberg A., Leese F. (2014) Detection and removal of PCR duplicates in population genomic ddRAD studies by yddition of a degenerate base region (DBR) in sequencing adapters. Biological Bulletin 227:146-160. Magwire M.M. *, Fabian D.K. *, SCHWEYEN H.*, Cao C., Longdon B., Bayer F., Jiggins F.M. (2012) Genome-wide association studies reveal a simple genetic basis of resistance to naturally coevolving viruses in Drosophila melanogaster. PLOS Genetics 8:e1003057 (* equally contributing authors). Scharsack J.P., SCHWEYEN H., Schmidt A.M., Dittmar J., Reusch T.B.H., Kurtz J. (2012) Population genetic dynamics of three-spined sticklebacks (Gasterosteus aculeatus) in anthropogenic altered habitats. Ecology and Evolution 2:1122-1143.